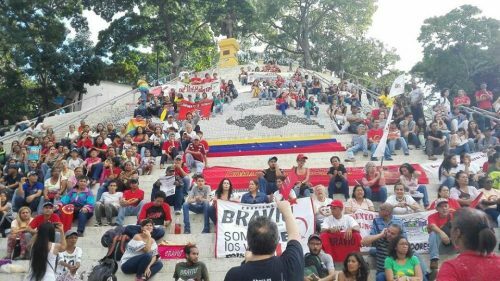 After weeks of imperialist threats and opposition violence, the elections for the Constituent Assembly (ANC) in Venezuela took place on July 30th. The result was a massive turnout of over 8 million voters, around 41% of the electorate, which gave chavismo a much-needed shot in the arm. The western media reacted by trying to dispute the number and sticking even closer to the narrative being pushed by the opposition and the US State Department. With the opposition scrambling and US authorities bringing more sanctions and threats, it is now chavismo that has the political initiative. The Constituent Assembly will not solve everything by itself, but it is a tremendous opportunity to push the Bolivarian Revolution forward. The opposition said 7.6 million Venezuelans participated in Sunday’s symbolic referendum, which the government labelled an internal party poll with no relevance for the country. There is no mention of the fact that people were free to vote more than once, that no electoral roll was used and that no audit was possible because everything was burned at the end of the day. Apart from this, in a recent article we explored other reasons why this total was very doubtful, based on simple estimations given the number of voting booths available. 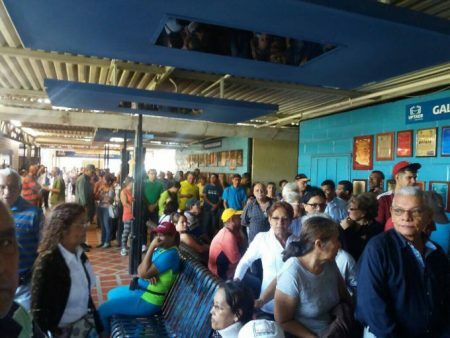 A phone conversation between opposition leaders in Aragua state also revealed how the numbers were being cooked. 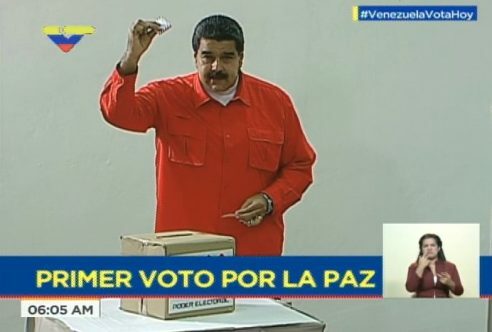 President Maduro was the first to vote, casting what he called “the first vote for peace”. In contrast, Sunday’s elections had the full weight of the electoral authorities behind them, over 12.000 voting centres and 24.000 voting booths, and the approval of international monitors. 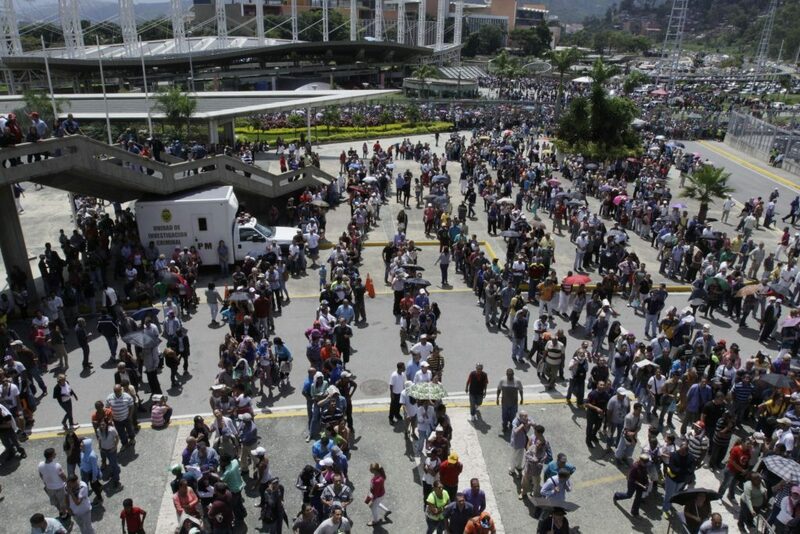 The main obstacle was the opposition’s violence, and so additional voting centres, such as the Caracas Poliedro pavilion, were set up for people who were not able to vote in their own neighbourhoods.1 Pictures showed voting queues forming since early morning and the voting deadline was extended so everyone could vote. National Electoral Council President Tibisay Lucena announced just before midnight that turnout was 41.53 percent, or 8,089,320 people. Members of the opposition said they believed between 2 million and 3 million people voted and one well-respected independent analysis put the number at 3.6 million. Based on what, exactly? If they have evidence, they should present it. Some pictures of empty voting centres in middle-class neighbourhoods, which for all we know could have been taken the day before, do not prove anything. Surely, among the thousands of electoral commission workers, one of them would report that there were 3 times more electronic votes than paper ballots in his centre. When Donald Trump claimed that he lost the popular vote because 3 million illegal immigrants voted for Hillary Clinton the media checked and disproved the wild claim. But apparently these standards, or any standards for that matter, do not apply to the Venezuelan opposition. It would be interesting to know the sample size, the margin of error, which voting centres were used and which baseline is being compared against. Exit polls work by comparing against exit polls from a previous election, or a model based on previous elections. Voters are interviewed during a certain period of time, and numbers are compared to similar ones in a previous election during the same time to predict turnout (and also how the vote might swing, which is not relevant in this case). Since exit polling has been forbidden in the past in Venezuela, it really makes us wonder how these predictions are made. We also need to point out that in this case not all voting centres are created equal. Given that the opposition flat-out refused to participate, turnout will have been much more suppressed in the opposition strongholds, and even more so in the vicinity of violent opposition barricades. An oversampling of these would inevitably skewer the prediction, which is why the data needs to be scrutinised and compared to the official results if it is to be taken seriously. The opposition’s long track record of crying fraud and presenting fabricated evidence (or none at all) also makes these claims very hard to believe. After winning the legislative elections in December 2015, the Venezuelan opposition announced that it would get rid of the government in six months. Following protests in September 2016, again we were told that the end was near. The same doomsday announcements were found in the recent wave of protests and violence. In response to the call for a Constituent Assembly, opposition leaders boldly announced that it would not take place! And finally, the opposition announced that their July 16th marked the “zero hour” of a new phase, in which they would nominate a “national unity” government. This was later downgraded to an “governability accord” which some factions refused to sign. Their demand that the Constituent Assembly elections be cancelled was also a failure. There is very little credibility left to this opposition that behaves like a doomsday cult, predicting the end of the world on a given day and later re-scheduling. For their own sake, one hopes that they have a “no refund” policy, otherwise funders like the National Endowment for Democracy or USAID might want their money back. The pressure and propaganda against Venezuela in recent weeks were centred on the idea that the simple fact of these elections taking place would mean the “end of democracy” and the definitive arrival of a “dictatorship”. Often absent from these pieces is the fact that everyone could vote and anyone could stand as a candidate. There is only one party in the United States, the Property Party … and it has two right wings: Republican and Democrat. The fact that Brazil (!) complained about the legitimacy of this process shows that an unexpected victim of last year’s parliamentary coup, which brought Temer to power, was irony. 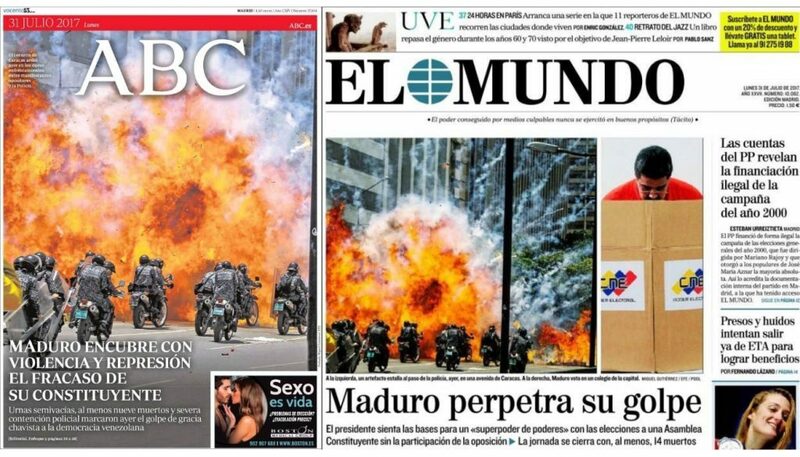 Mainstream outlets were determined to paint the narrative of government repression but could not resist using a photo of a bomb detonated by the opposition against security forces. As a result, many simply referred to an “explosion” without identifying the culprits! – the US initially refused to recognise the results of the 2013 Venezuelan presidential election, even after it was proven beyond any doubt that Maduro was the winner. – the US and Spain rushed to recognise Pedro Carmona’s government after the 2002 coup, even though the coup authorities dissolved all public powers. – European countries and later the US recognised an unelected body, chosen by delegates appointed by the various sponsors of the Syrian war, and operating in Turkey, as “the legitimate representative of the Syrian people”. This body would later be consigned to irrelevance. To these we could add a multitude of leaders who came to power following bloody or back-door coups, from Pinochet to Temer, and never had any trouble being “recognised”. The Israeli apartheid regime has no issues in terms of recognition despite its permanent history of crimes and ethnic cleansing. So there is hardly any correlation between legitimacy and recognition from the US and its followers. The poor showing in 2015 was blamed by the grassroots on the top-down nature of the chavista electoral machine, which simply chose the candidates. For these elections the more radical sectors were able to put forward their own candidates, and as a result many people who would not necessarily vote for Maduro or for PSUV legislative candidates went out to vote for the specific proposals put forward by friends, co-workers and comrades. In retrospect, Maduro’s gamble can only be seen as a huge success for chavismo and a huge failure for the opposition. With the opposition ramping up (violent) pressure on the streets and claiming they were an overwhelming majority, Maduro essentially “called their bluff” (phrase borrowed from Mike Prysner). By calling for a Constituent Assembly, Maduro hoped, and managed, to galvanise chavismo with a participatory process that could reach the bases, and at the same time expose the opposition by forcing them to bring forward their ideas. Polls reveal that Venezuelans are aware that the opposition has no plan whatsoever, and the opposition duly backed itself into a corner by refusing to participate, reducing their political arguments to these lobotomised slogans “we do not want to be Cuba”. While the turnout represents a victory for chavismo, the battle is far from over. The Constituent Assembly is not a magical cure for all problems, and whatever comes out of it will depend heavily on the balance of forces among its members. Now more than ever it is urgent to make a clear push to the left, with more power to the communes, increased worker control over the economy, expropriations against the instigators of the economic war, etc. With the opposition hell-bent on their violent regime change plans and a permanent imperial onslaught, only radicalisation will ensure the survival of the Bolivarian Revolution. This article was posted on Tuesday, August 1st, 2017 at 4:41pm and is filed under Disinformation, Fake News, Media, Narrative, Politics, Propaganda, United States, US Hypocrisy, Venezuela.